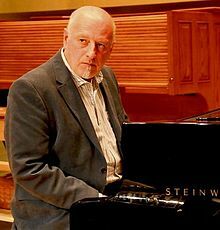 Roger Doyle is an Irish composer best known for his electro-acoustic work and for his piano music for theater. He was born in Malahide, County Dublin in 1949. Doyle began as a drummer with Supply Demand and Curve and Jazz Therapy playing free-improv and fusion music. He composed the album Rapid Eye Movements including the work “Fin-estra”, as his attempt at a ‘masterpiece before the age of thirty’. He released his first LP Oizzo No in 1975, and his second Thalia in 1978 on CBS Classics. Rapid Eye Movements was his third LP. Thalia has I have it here, has been repackaged and remastered in 2002. You can get the full set these days including the extremely rare self-released 1975 debut LP “Oizzo No” and his second LP “Thalia” from 1978,which I have featured here today. Thalia is Doyle’s first large-scale electronic piece, composed at the age of twenty-six. Thalia parts 1 and 2 are a hotch-potch of sounds, including eerie psych synth, a woman crying as she sings, sped up speech and a bit of jazz live improv that evolves into a marching band. Thalia part 3 is more like a journey into hades, and one can see the beginnings here of Doyles movement into theatre. I love track three -the discordant synthy drone against the woman crying evokes a feel of abandonment, banishment to a wasteland or the acceptance of a sentence that is irreversible. The sirens that comes in increase the sense of foreboding as the music slowly rises over the top of her tears. Doyle will allow the music to drop away, sometimes making room for silence, and at other times using the silence more as a break. Silence is always present in his work – something I don’t always get a feel for with electronica, but there is the ever-present overwhelm of the emptiness of the “everything outside of me”. Doyle keeps this sweeping feeling of void throughout the entire piece changing direction regularly. The little about faces – like the addition of the rhythmic laughter against the marching band sound- only serve to add to the alienation of the woman’s lone voice, as if they are more prof that she is alone rather than evidence of their own presence. It’s a remarkable achievement of “gluing” sound together in order to evoke intense mood. Doyles future theater connections are apparent all the way through Thalia, but he was hell-bent on creating a major artistic achievement in sound before the age of thirty. He was thrifty with his grant money and worked hard to produce works of outstanding quality. It’s hard to decide if the three albums he made before thirty are his opus – but one thing is for sure. they are exquisitely beautiful and unique in the world of music.